It was the March kit reveal at Scrap Shotz. 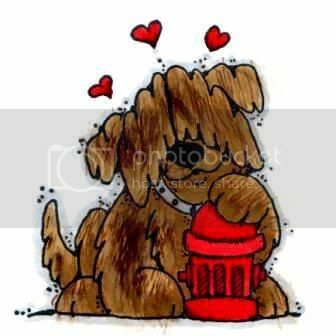 This month it was a later than usual as we "patiently" waited for the newly released from CHA, Distressed Couture from Glitz Designs. I think you'll agree that it was completely worth the wait!. Here is an excerpt of the projects from the Design Team. When I first saw this layout from Amber, I fell in love. I love the circles of different pattern papers. And my love continued with Heather's layout. Then I started to drool over Denise's card! Look at THAT flower...wowsers!!! And my heart melted with this layout from Rosie! Don't you love the handwriting from her daughter? Precious, absolutely precious! What do YOU think of the reveal? Let me know! Laura's distressing is AMAZING! And her handmad paper flowers are stunning! 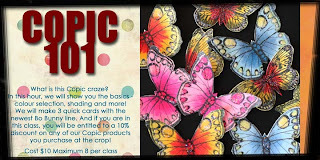 From Corry (croppincorry)...a Card Crew challenge card...gorgeous! Leave these ladies (and others) some love in the gallery and let me know what you think of my picks this week! Fabulous Friday - Anything But!!!! It's just another Fabulous Friday here at Scrap Shotz! And our challenge today is from the lovely Denise! Her challenge is "Anything But" boring...because it's just SO darn cute!!! 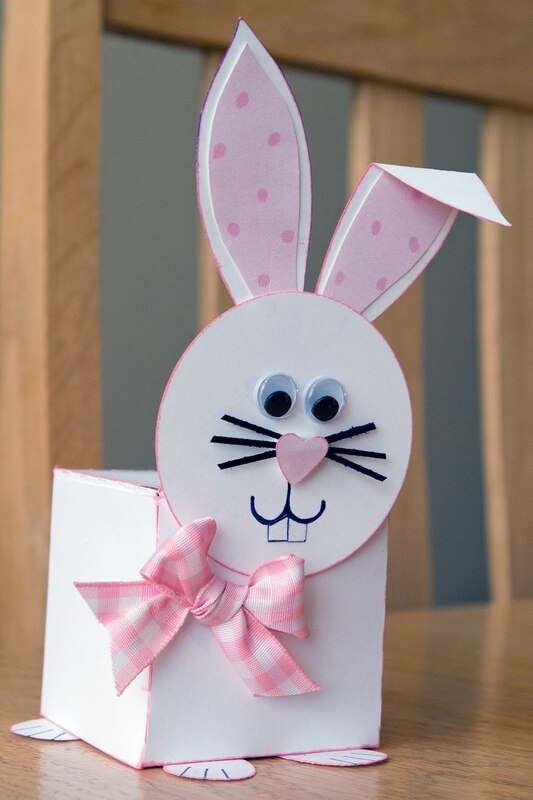 Looking for a cute little decoration for your Easter table? This adorable bunny was made from a box file cut on my Silhouette but there are lots of templates on the net to create boxes or you could use take-out-boxes, bagolopes, etc. When the lid is opened you will find blue easter grass (the only colour we had in the house!) protecting a couple of chocolate eggs but you could fill it with whatever your heart desires. I used punches for the nose and circle head but everything else was hand cut…and there is indeed a cotton ball attached to the back for a puffy bunny tail. 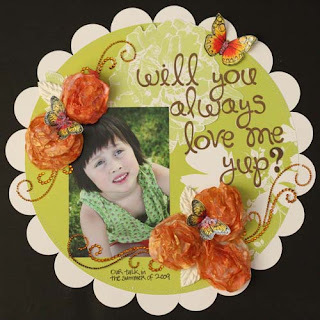 I adore this project Denise! What do you think???? Sssh! I know it's Friday *blush* Yesterday was crazy busy for me! Our challenge this week is colour fur. What I love so much about Copic markers is their seeming ability to colour anything. Here are links to 2 tutorials on how to colour fur. As with anything, there are many ways to do it, try them both and see what works best for you. I used Crissy Armstrong's youtube video and technique - be prepared for the laughing section in the middle! When I watched it I had a big smile on my face! And here is another technique from Marianne Walker. And here are Lorraine's beautiful beautiful samples! Doesn't this make you drool??? So let's get colouring! Don't forget to link me up, ok? 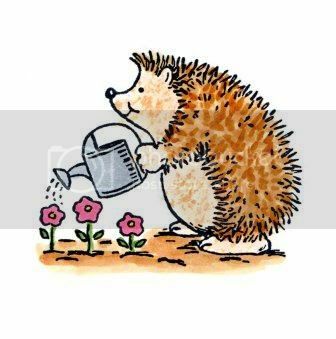 It is now officially Spring and I have to tell you that I love the longer days, the chirping birds and even the muddy shoes! LOL To me, there is no bigger sign of spring that the sight and sound of birds outside on the trees; wouldn't you agree? 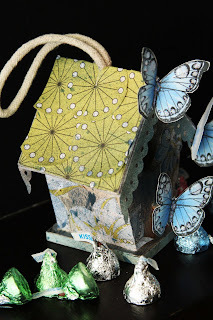 So, in honour of spring, here is an altered birdhouse. The papers are from Urban Lily. The birdhouse is from the dollar store. But what I think really makes the bird house is the swirling butterflies. The butterfly images are from Hero Arts and are coloured with Copic markers, all available at Scrap Shotz. 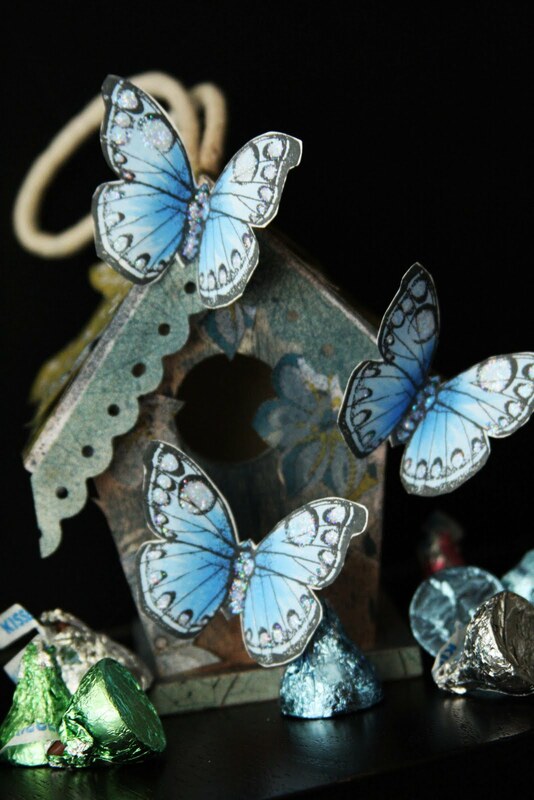 The entire birdhouse has been liberally sprayed with Tattered Angels glimmer mist, also available at Scrap Shotz. Do you alter? Can you share with me your altered projects? It's Virginia here and I am covering for Jess while she is on vacation. I always love going into the Scrap Shotz gallery and seeing everyone's work. Here are some projects that caught my eye this week. Let's start with the Hello Kitty party theme from MamaPod (Erica). 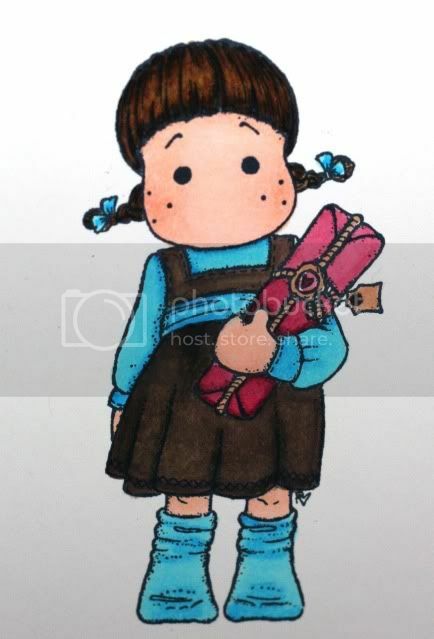 What little girl (or big girl for that matter?) isn't going to be oohing and aahing over these invitations??? I love Kelly's painted "border" around the picture and the retro peace sign. 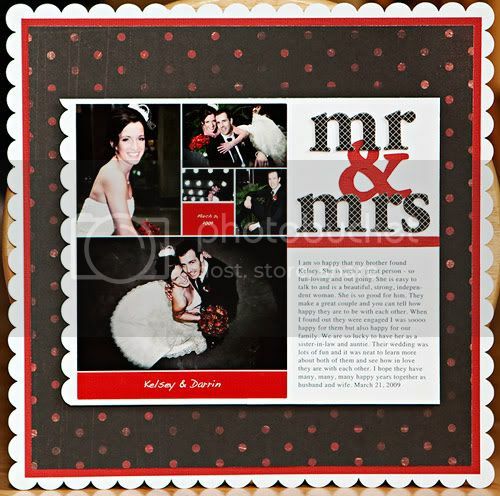 And I love how Jillian used her ribbon on this layout. Thanks ladies for sharing your work! I am so inspired right now. What about YOU? What a weekend this is going to be??? Scrap Shotz is a sponsor at the Crop4Kids crop this weekend. Jess and I are each teaching a class...and we are super excited!!! If you are coming, please take the time to introduce yourselves to Jess and me, ok? And now how about a Fabulous Friday challenge???? Today we have an Inspiration Challenge. Are you ready??? And here is my layout. I was initially inspired by the gorgeous blues and greens and the tapestry-like print. How were you inspired by this dress? Is it the birds? The splash of red? Or the fun print? Whatever it is, I would love to see your inspiration project!!! Link me up, ok? Well we've all been trying to get the hair right haven't we? 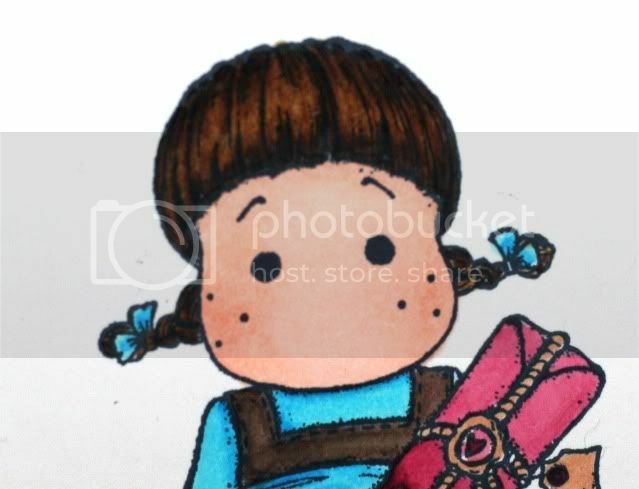 Your challenge this week is to color an image with brunette hair. And finally a gallery of brunettes! OK girls let's get coloring brunettes! I can't wait to see all your samples! Come out and join me and Jess at Crop4Kids this weekend! Jess and I are both teaching classes, sponsored by Scrap Shotz and all proceeds go to the Alberta Childrens Hospital. I am teaching an Introductory Copic class. 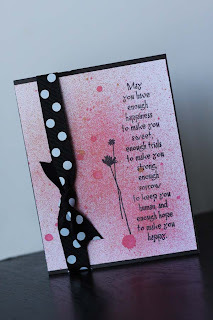 I was recently in the very hurried need of a card and challenged myself to make a stamped card. One of the techniques that I like and have not used much is Rolled Stamping. Now I am not sure if that is the "official" name of the technique but it certainly describes the following pictures!!! 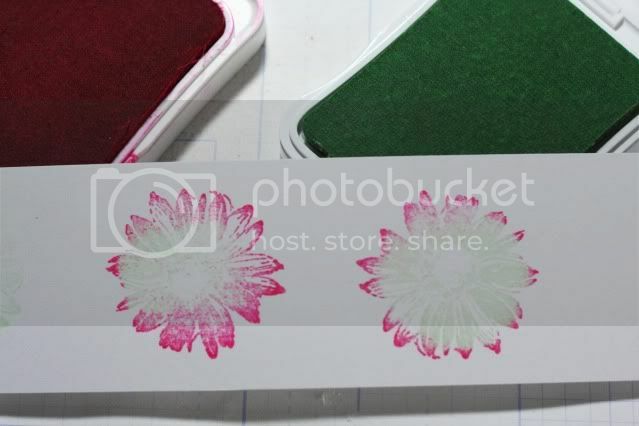 You will need a stamp set that is NOT a lined drawn image; 2 colours of ink and of course paper. 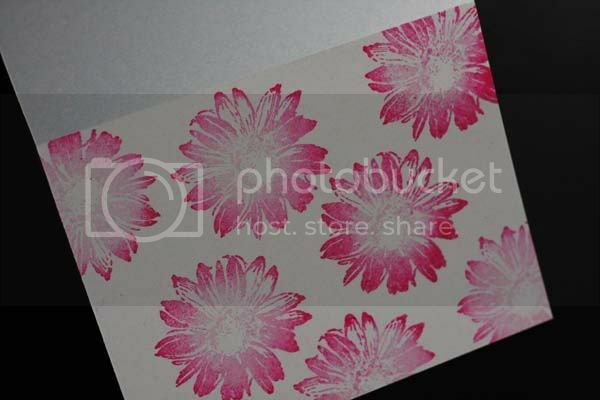 Cover your stamped image with the LIGHTEST colour first. Then with the now inked image, tip the stamp on its edge and "roll" the edges of the image on the darker ink so you are only inking the EDGES. Then stamp! 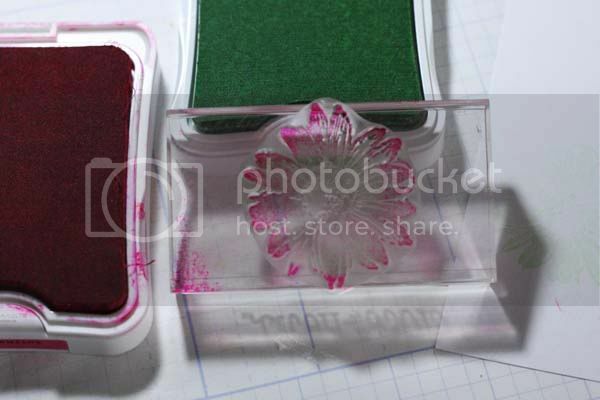 I used 2 very different colours so you could see the areas of the ink and stamp. You may prefer a more subtle look and use shades of the same colour. 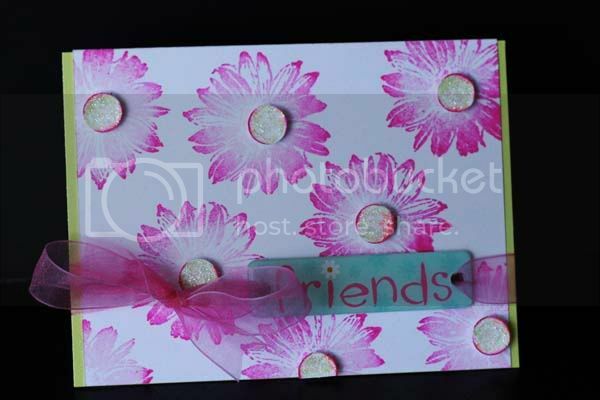 I randomly stamped the image on my card front and then embellished each of the flower centres. Voila! A quick and easy card for a special birthday girl! 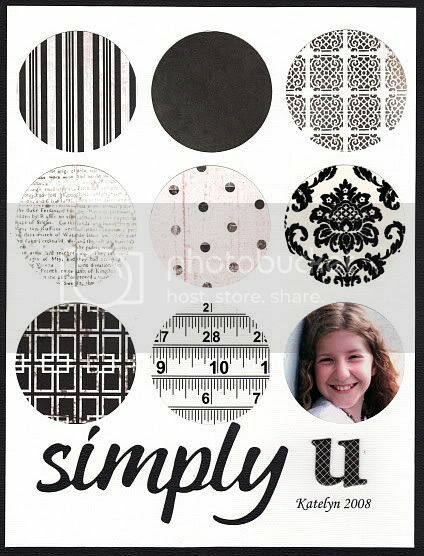 Can you show me your stamping??? 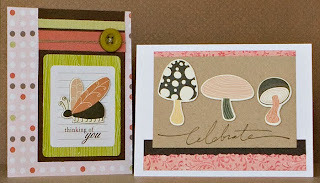 Well Laurel has been dazzling us with a beautiful array of cards this week so I wanted to share a few with you... I know you will love them as much as I do! 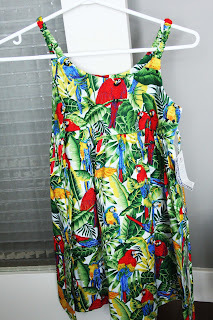 This one is perfect for summertime! Anyone up for a road trip??? 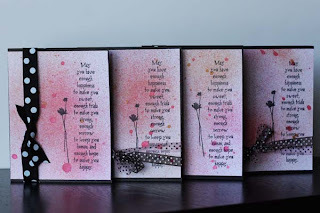 There are many more fabulous cards waiting to inspire you in the Scrapshotz gallery... go take a look! Oh boy! We are in for a treat this weekend! Our challenge this Fabulous Friday is a Chromotherapy challenge from the lovely Heather. I personally love pink - brown - and anything! What about you???? Well we had a lot of practice coloring skin this week. I still don't think I have it mastered but it's coming along! Hope you can join in this week... make sure to link me to your challenge sample in the comments section! I aspire to being an intricate and beautiful cardmaker but I personally find the smaller real estate of a card to be horribly intimidating! *blush* I seem to do better by keeping the card simple and sincere. 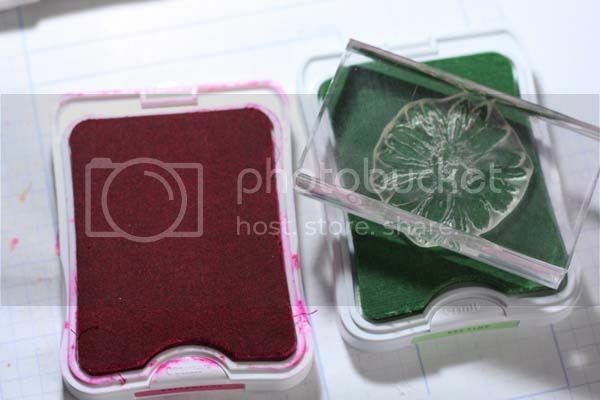 Below is a set of cards I made in 15 minutes with only cardstock, glimmer mist, a special stamp and a few snippets of organza ribbon. I hope to see your set of simple and sincere cards!!! Please link me up, ok? Monday again! Let's see what I found in the gallery this week! 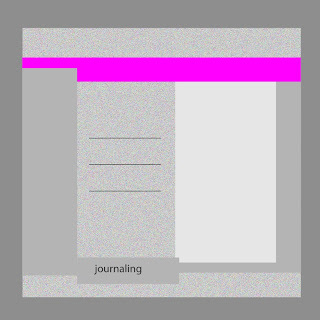 I haven't posted any of the creations from our blog challenges yet, so I wanted to show you this one by croppincorry... It was for Virginia's tissue paper blossom challenge. I just love her blossoms, the color combo, and the placement of her journalling! Great work! Be sure to post your blog challenge creations in the gallery for everyone to enjoy! See you next Monday for another peek into the gallery! On a Fab Friday in November of last year, the talented Denise provided an excellent tutorial on making your own blueprint in PSE. Her instructions are obviously excellent because even I could understand and follow them, lol! Here is my very first blueprint! I can’t wait to see how the talented members of SSZ interpret it! It's fabulous; don't you think??? 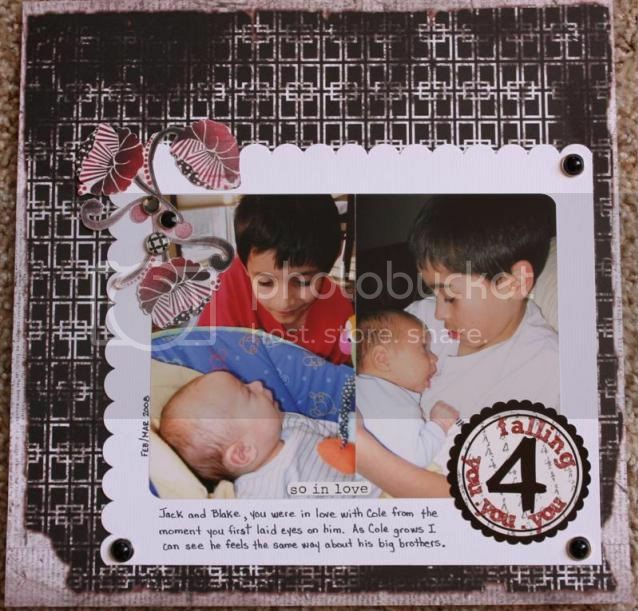 Thanks Rosie for an awesome challenge and sharing your gorgeous layout! Hello everyone!!! I hope you've been busy coloring this week! Please get ahold of Sandy and let her know that you are our February winner! Thanks for playing along! I need a lot more practice getting a shadow on the face... and on the blush too... it's a lot harder than it looks! Please link here with your sample, or upload into the forum thread for your chance to win a free copic marker... aand the grand prize of 20% off your entire copic order! I cannot believe it is March already; can you? 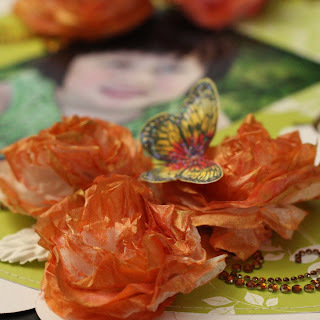 This March at Scrap Shotz, I'd like to share with you a series of projects, tips and tricks and inspiration. 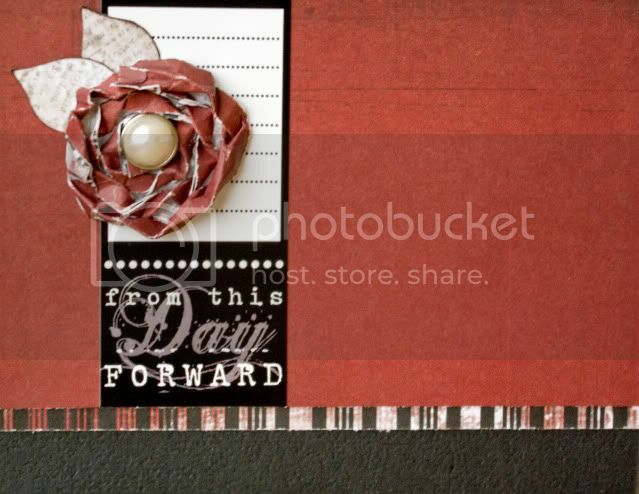 You can incorporate these ideas into your home decor or cards or layouts. Let's have some fun, shall we? To kick off National Craft Month, I'd like to share some instructions on how to make the tissue paper flowers on my layout below. Handmade, slightly imperfect flowers are all the rage now. 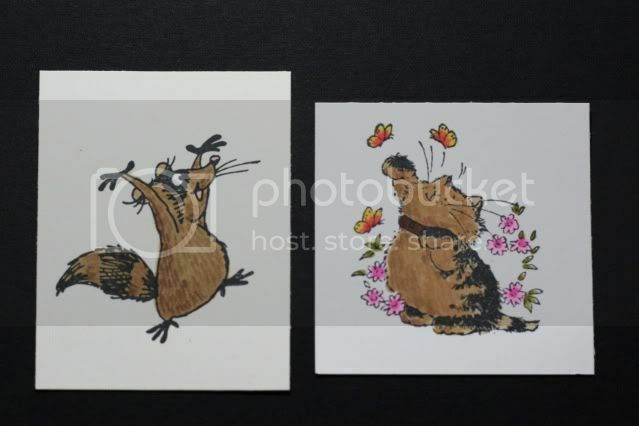 They can be distressed, coloured with glimmering mists or jazzed up with some Copic air brushing. Either way, flowers are fun and oh so easy to make. I used white tissue paper. The tissue paper I used had a matte and a glossy side. Using my circle punch, I cut a swack of circles all the same size. You could definitely use different sizes of circles but I like to challenge myself to complete projects in 30 minutes or less! Next, gather up the circles and insert a brad to hold the circles together. Then "fluff" up the circles by scrunching them. Now you have a colourless but cute flower. You can choose any option to colour your flower now. I used two different colours of Tattered Angels glimmer mist because I like the depth that the secondary colour gives it. After the glimmer mist dried, I "painted" on some Ranger Glossy Accents and dusted on some Pink Paislee Pixie Stix. I love the look; do you? To finish off my floweers, I used my Hero Arts stamps and coloured them with my Copics. 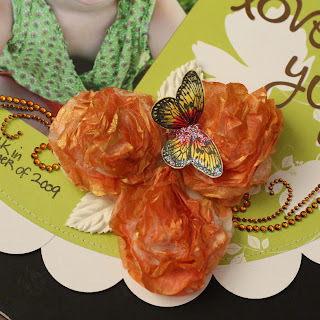 I hope to see your tissue paper flowers too! Well, I am finally caught up from going on vacation! Caught up on my sleep, the laundry, the cleaning and all the other stuff! Congratulations ladies! Your comments are greatly appreciated! I read each and every one of them! Hello! Virginia here. I am filling in for Jess while she is on vacation...big shoes for me to fill. 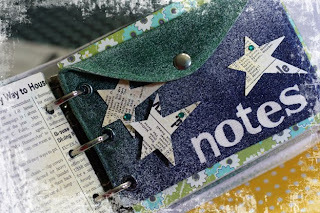 The Scrap Shotz gallery is chock full of inspiration, beauty and talent. Here are a few that caught my eye this week. Here is a layout from croppincorry that so reminds me that Spring is coming! And I just had to pick one more! Jillian's treatment of the ribbon caught my eye in the gallery! Thanks girls for sharing your talents with us! I look forward to more of your work in the gallery! What's caught your eye in the gallery this week? With the DT call in full swing we had a gallery just bursting with incredible talent again this week! I want to share a layout that inspired me personally from Nicole N... after seeing this one I actually misted a piece of paper and embraced the splotches! Here it is... I love her style! Be sure to check out the gallery... there is so much more to enjoy!